Where does violet end and lilac begin? In one of Antonioni's films that I discuss in these pages, two characters meet by chance outside a theater after watching the same film. They talk about one another, about the chance of their encounter, but of the film they have not a word to say. A film can enter us and reside there, turning and changing through our biography and our fortune. To evoke a film, speak of it, try to write its long and ghostly presence: and especially an Antonioni film, one of the eight major works in color that he produced starting in 1964, after it became hopelessly apparent that color was his world: to face the growing fact of a film, honest as to its structure, its repetitions, its allusions and elusions, its tones, the way something suddenly becomes obvious that was invisible before, to address a film not only as subject material but as form, is my challenge here. That a story does not mean everything, indeed sometimes means nothing. That a revelation can be charged through the turn of a face from shadow into light, colored shadow into colored light. Colors, after all, are more than facts, more than indications. Color has resonance, descends into a past, causes us to remember and fall. To find-not the theme, not the statement, but-the song of the films, what they intimate and how they intimate it, not their formula but their personality. "There are, indeed, things that cannot be put into words," wrote Wittgenstein (Tractatus 6.522). So, these eight meditations might have been a string of silences. It is always difficult to use language for coming to terms with a cinematic image, especially Antonioni's images, brilliant, provocative, fugitive. Stanley Cavell said the problem beautifully of another book: "Its difficulty lies as much in the obscurity of its promptings as in its particular surfacings of expression" (162). The Antonionian surface is complicated by delicacy, pain, rhythm, distance, time, urgency, body, the perils of sound. Cavell also suggests that in color films, "the world created is neither a world just past nor a world of make-believe. It is a world of an immediate future" (82). Antonioni always has his eye on the future: What is this? That is, what is this becoming? 1. What people-that is, characters-say in film is not the same as what we see. 2. There is no proper treatise for elucidating or unlocking the puzzles Antonioni has left us. The puzzle, the mystery, is a quintessentially serious form. 3. What James Agee wrote of Charles Chaplin's Monsieur Verdoux: "Disregard virtually everything you may have read about the film. It is of interest, but chiefly as a definitive measure of the difference between the thing a man of genius puts before the world and the things the world is equipped to see in it" (253). First, I do not deal with the very lengthy Chung Kuo-Cina (1972), or the rather brief Il Provino (1965); Ritorno a Lisca Bianca (1984); Roma (1989); Kumbha Mela (1989); Noto, Mandorli, Vulcano, Stromboli, Carnevale (1993); Sicilia (1997); or Lo Sguardo di Michelangelo (2004). This book is about the major color narratives, only. Next, there is no attempt here to work out or exercise a color theory, nor should there reasonably be, since color as Antonioni uses it is not a rigid language nor a set of tools but part of the sense of the world at any moment. For children, wrote Benjamin, "picture books are paradise"; and "children learn in the memory of their first intuition." Also, "For adults, the yearning for paradise is the yearning of yearnings" ("Notes" 264, 265). What we know as a vocabulary of color is only a shallow abstraction suffered through the bureaucratic press of social organization in the modern world, but with color we always see more than we know how to say. "Color," say Morgan Russell and Stanton Macdonald-Wright, "is just as capable as music of providing us with the highest ecstasies and delights" (Levin 129; qtd. in Gage, Culture 241). As to the technology of his color-among the fans of which was Alfred Hitchcock (Robertson, Letter to Ascarelli)-we would do well to remember that no matter who shoots a film and how, it is the producer who arranges for the printing (Pomerance, "Notes on Some Limits"). Antonioni had the luck to find producers who trusted his poetry. Lastly, stories and story analysis absorb the attention of the vast majority of scholars and writers who take up cinema. But films are events in themselves, not packages for stories. There are only happenings in film, and happenings are everywhere. A purple coat, a pink cottage. Here, I often jump around, neglect "narrative continuities." The reader is encouraged to find a happy way of balancing all this. Viewing is balancing, at any rate. In Cahiers du cinéma of May 1980, we find a little note from Antonioni to Roland Barthes, including this (in my translation): "Thank you for Camera Lucida, which is at once luminous and very beautiful. It astonishes me that in chapter three you describe yourself as being 'a subject torn between two languages, one expressive and the other critical' ... But what is an artist if not also a subject torn between two languages, one language that expresses and another that does not?" Immediately after this, the maestro added, "I was in the middle of writing this letter when news came to me by telephone that Roland Barthes had died." On the morning of July 31, 2007 when I learned that Antonioni had died-he had been debilitated for some long while-I was stunned, because that night I had dreamed of him. And I thought how wonderful it was that we still had his films. The more I watch them now, the more I feel affected by the language that does not express. 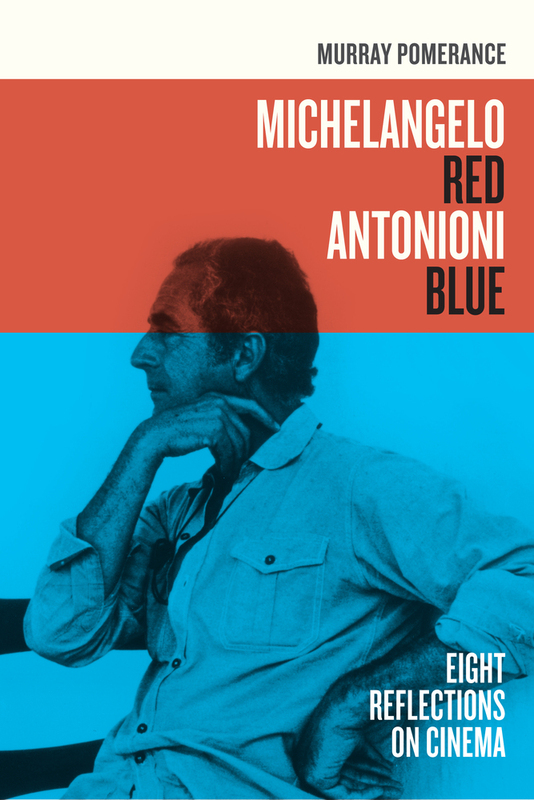 Michelangelo Antonioni, who died in 2007, was one of cinema’s greatest modernist filmmakers. The films in his black and white trilogy of the early 1960s—L’avventura, La Notte, L‘eclisse—are justly celebrated for their influential, gorgeously austere style. But in this book, Murray Pomerance demonstrates why the color films that followed are, in fact, Antonioni’s greatest works. Writing in an accessible style that evokes Antonioni’s expansive use of space, Pomerance discusses The Red Desert, Blow-Up, Professione: Reporter (The Passenger), Zabriskie Point, Identification of a Woman, The Mystery of Oberwald, Beyond the Clouds, and The Dangerous Thread of Things to analyze the director’s subtle and complex use of color. Infusing his open-ended inquiry with both scholarly and personal reflection, Pomerance evokes the full range of sensation, nuance, and equivocation that became Antonioni’s signature. Murray Pomerance is Professor of Sociology and Media Studies at Ryerson University. He is the author of Johnny Depp Starts Here, An Eye for Hitchcock, and Film Experience Beyond Narrative and Theory, among many books.